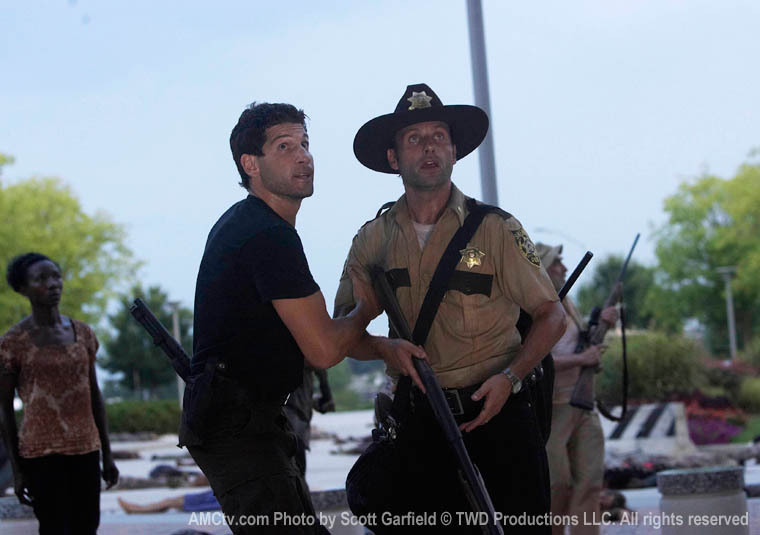 Jim (Andrew Rothenberg) was bitten by a walker during the attack that killed Amy (Emma Bell). He tried to keep it a secret, but Jacqui (Jeryl Prescott) noticed fresh blood on his shirt and immediately ratted him out. That made sense; too often in these situations, a friend is recruited to keep the secret. “I’m okay,” Jim kept insisting, although everyone (including Jim) knew he was pretty effin’ far from okay. As he grew weaker, he had visions of himself turning into a zombie, which was creepy, but also kind of cool to get a glimpse of the transformation through the mind’s eye of a victim. Even knowing Jim’s inevitable fate, Rick (Andrew Lincoln) wouldn’t let Daryl (Norman Reedus) kill the infected Jim: “We don’t kill the living,” he warned, even as he pointed his weapon at Daryl’s skull. Speaking of Amy, Andrea (Laurie Holden) refused to let anyone near her beloved little sister’s corpse. She just kept hovering over the body. Rick wanted to tell Andrea “the way it is,” but she laid down the law with her own .45. And then once again, when the inevitable happened, and Amy came revived. It was totally creepy the way Amy slowly came back to life — well, unlife — so very slowly. She started with shallow breathing, then twitchy limbs…. When her eyes opened, they were bloodshot, with pale irises. Her breath was sucked between dead lips. As Andrea apologized for missing so many birthdays when they were growing up, viewers were doubtless screaming at the TV, “She’s not your sister anymore! She’s a zombie!” Andrea tenderly embraced her little sis one last time, and then lovingly blew Amy’s brains out. 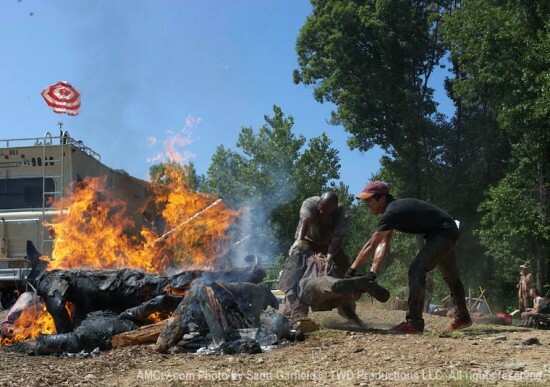 The scene was very sad, but told viewers a lot about the process of being turned into a walker. We knew zombies used their lungs, because they make groaning noises, and growl, but this sequence seemed to imply that they breathe the way the living do. Disturbing as it was, the sequence made the entire episode worth it. For all the wailing and gnashing of teeth, the crew made it to the CDC with little incident. Well, they did stop to let Jim out, because he couldn’t travel anymore. “My bones are like glass,” he protested about the roughness of the ride. “I’m okay,” he repeated as he insisted the group leave him behind.The irony is that he dug all those graves, but didn’t get to use the one he needed. They left Jim beneath a picturesque tree, but his end would be far from pretty. It’s interesting that Jim refused Rick’s proffered gun, preferring to eventually transform into a flesh-eating monstrosity. The decision went by quickly, but there is a larger question there: What would you do? At CDC itself, Dr. Jenner (Noah Emmerich) has been transmitting regular video updates of this work, this being 194 days since “wildfire” was declared, and 63 days since the disease went global. He has been working on a cure, apparently alone and underground. (Hmm… Desmond from LOST, anyone?) He…er, lost his prized TS-19 walker samples (the freshest) to an accidental chemical spill; the lab had to be sterilized as part of “full decontamination,” torching all the TS-19. Despairing, Jenner decided he was the last man on Earth, and resolved to kill himself tomorrow. Then Rick’s little band showed up. Jenner hesitated to let them inside. Why? Notice that Jenner stared at Rick and the others like he didn’t believe they were real; who knows how long it had been since he’d last seen a living person? Jenner whispered, “Just go away,” at the monitor. Rick was convinced someone was inside the CDC when a security camera moved, and he literally begged to the camera, citing the women and children as he pleaded. “You’re killing us,” Rick screamed as Shane dragged him off. But then Jenner relented and opened the door, bathing the survivors in blinding white light. The figurative “light at the end of the tunnel” was literally the bright lights of the CDC when Jenner opened the door. But will the light lead to salvation? This entry was posted in Cult TV, Horror, TV and tagged Andrew Lincoln, Sarah Wayne Callies, The Walking Dead, Walkers, zombies. Bookmark the permalink.